Yes, mold can be good — it’s essential in making brie and penicillin, for example, and necessary for the decomposition of organic matter in nature — but it can also be very, very bad, especially when it grows undetected in your home. 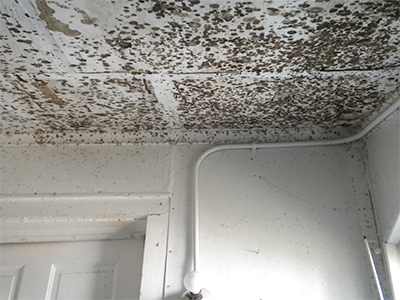 Mold can grow anywhere: on carpet, clothing, food, paper, and even in places you can’t see, such as the backside of drywall, areas inside walls around leaking or condensing pipes, and above ceiling tiles. So what can you do if you’re concerned about mold growing in your home? 1. Identify problem areas in your home and correct them. You can’t mold-proof your home, but you can make it mold-resistant. Do an audit of your home: where are the problem areas? Does the basement flood? Do you notice frequent condensation on an upstairs window? Is there a water stain on the ceiling from a persistent leak? Preventing mold from growing or spreading might be as simple as ripping up carpet in a damp basement, installing mold-resistant products, or repairing damaged gutters. Or it may be a matter of major excavation and waterproofing. Whatever the case, address the problem now. It might cost some money up front, but it will surely be more costly down the road if mold continues to grow unchecked. 2. Dry wet areas immediately. Mold can’t grow without moisture, so tackle wet areas right away. Seepage into the basement after a heavy rainfall, accumulation from a leaky pipe, even a spill on the carpet should be dried within 24 to 48 hours. If you’ve experienced a flood, remove water-damaged carpets, bedding, and furniture if they can’t be completely dried. Even everyday occurrences need attention: don’t leave wet items lying around the house, and make sure to dry the floor and walls after a shower. Don’t leave wet clothes in the washing machine, where mold can spread quickly. Hang them to dry — preferably outside or in areas with good air circulation. 3. Prevent moisture with proper ventilation. It may be that your routine domestic activities are encouraging the growth of mold in your home. Make sure an activity as simple as cooking dinner, taking a shower, or doing a load of laundry doesn’t invite mold by providing proper ventilation in your bathroom, kitchen, laundry room, and any other high-moisture area. Vent appliances that produce moisture — clothes dryers, stoves — to the outside (not the attic). Use AC units and dehumidifiers (especially in humid climates), but make sure they don’t produce moisture themselves by checking them periodically and cleaning them as directed by the manufacturer. Your energy-efficient home may be holding moisture inside, so open a window when cooking or washing dishes or showering, or run an exhaust fan. 4. Equip your home with mold-resistant products. Building a new home or renovating an old one? Use mold-resistant products like mold-resistant drywall or mold-resistant Sheetrock, and mold inhibitors for paints. Traditional drywall is composed of a gypsum plaster core pressed between plies of paper. Mold-resistant drywall is paperless — the gypsum core is covered in fiberglass, making the surface highly water-resistant. Moisture-resistant drywall is especially valuable in areas prone to wetness, such as bathrooms, laundry rooms, basements, and kitchens. Not only is traditional drywall more susceptible to mold than the paperless kind, but it is also difficult to rid of mold, and removal and replacement can be expensive. Mold-resistant gypsum board is also available; the core of the drywall is developed in such a way to prevent moisture absorption, and thus prevent mold growth. 5. Monitor humidity indoors. The EPA recommends keeping indoor humidity between 30 and 60 percent. You can measure humidity with a moisture meter purchased from your local hardware store. You’ll also be able to detect high humidity by simply paying attention to potential problem areas in your home. Telltale signs of excessive humidity include condensation on windows, pipes, and walls. If you notice condensation, dry the surface immediately and address the source of moisture (for example, turn off a humidifier if water appears on the inside of nearby windows). 6. Direct water away from your home. If the ground around your home isn’t sufficiently sloped away from the foundation, water may collect there and seep into your crawlspace or basement. 7. Clean or repair roof gutters. A mold problem might be a simple matter of a roof that is leaking because of full or damaged gutters. Have your roof gutters cleaned regularly and inspected for damage. Repair them as necessary, and keep an eye out for water stains after storms that may indicate a leak. 8. Improve air flow in your home. According to the EPA, as temperatures drop, the air is able to hold less moisture. Without good air flow in your home, that excess moisture may appear on your walls, windows and floors. To increase circulation, open doors between rooms, move furniture away from walls, and open doors to closets that may be colder than the rooms they’re in. Let fresh air in to reduce moisture and keep mold at bay. 9. Keep mold off household plants. They’re beautiful and help keep your indoor air clean — and mold loves them. The moist soil in indoor plants is a perfect breeding ground for mold, which may then spread to other areas of your house. Instead of getting rid of your plants, try adding a bit of Taheebo tea to the water you give to your houseplants. The oil of this tree, which withstands fungi even in rain forests, helps hinder mold growth in plant soil and can be found at natural food stores. Finally, educate yourself on your region’s climate — be it the cold and wet Northeast, the hot and wet South, the hot and dry Southwest, or the cold and dry West — and how it responds to moisture. There is no one-size-fits-all solution when it comes to mold prevention. Knowing what works for your climate and your home is an important first step.